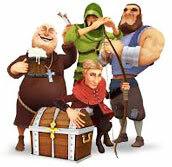 https://PlaySlots.Games promises to provide complete, accurate, and current information to the best of our knowledge. Should you observe any incomplete or inaccurate information, please notify us via the contact form. PlaySlots.Games assumes no legal responsibility for errors or omissions in these materials. Materials are provided “as is” without warranty of any kind, express or implied, including, but not limited to, the implied warranties of merchantability, fitness for a particular purpose, or non-infringement. PlaySlots.Games further does not guarantee the accuracy or completeness of the information, text, graphics, links or other items contained within these materials. "PlaySlots.Games" shall not be liable for any special, indirect, incidental, or consequential damages, including without limitation, lost revenues or lost profits, which may result from the use of these materials. The information on this server is subject to change without notice and does not represent a commitment on the part of "PlaySlots.Games" in the future. At PlaySlots.Games (formerly known as LiveSlotsDirect.com) we are doing our best to provide our visitors and players with the most up to date information available on some of the best real money gambling slot machines and exciting opportunities to play online slot games for free without depositing real money. The following sections of our site, as well as others are being updated to present the latest in what's being offered by real online casinos on the world wide web: new slots online, video slots online, 3d slots online, most popular online slots, and information on where and how to play slot machines for real money. © Copyrighted material. All rights reserved. All trademarks mentioned herein belong to their respective owners. Unless identified with the designation "Copy Freely,” the contents of this Web site are copyrighted by PlaySlots.Games. PlaySlots.Games hereby authorizes you to copy documents published by PlaySlots.Games on the World Wide Web for non-commercial use within your organization only. In consideration of this authorization, you agree that any copy of these documents you make shall retain all copyright and other proprietary notices contained herein. Individual documents published by "PlaySlots.Games" on the World Wide Web may contain other proprietary notices and copyright information specific to that individual document. Nothing contained herein shall be construed as conferring by implication or otherwise any license or right under any patent, trademark or other property right PlaySlots.Games or any third party. Except as expressly provided above, nothing contained herein shall be construed as conferring any license or right under any copyright or other property right of PlaySlots.Games or any third party. Note that any product, process, or technology in this document may be the subject of other intellectual property rights reserved by PlaySlots.Games and may not be licensed hereunder.